Explore how XenoPort used ValueCentric’s PharmacyView services to successfully relaunch an under-performing product. 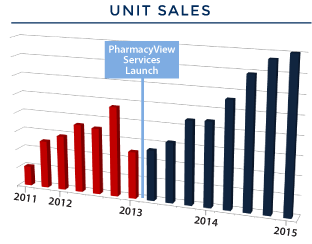 PharmacyView services allow you to comprehensively understand your market landscape and product potential. Decile and segment pharmacies, identify and prioritize your greatest opportunities, create stocking strategies & goals, and track performance over time. Highly accurate estimates of store-level sales when actual data is not available. Track your product inventory at the national, chain, and store level – understand current inventory liabilities, and identify unusual increases or decreases over time. Leverage Rx and sales data across a therapy class to develop pharmacy segmentations and promotional strategies that align with your current marketing strategy. Track your product inventory in comparison to sales, returns and Rxs to fully understand the product landscape. Gain insight into detailed financial information about competitive products to help understand the payer/plan/product dynamics. Identify changes in reimbursement patterns and formulary status in real time, months before primary research results are available. Research changes in reimbursement across payers over a time period. Achieve real-time results for quick reaction to market events. Quickly identify changes in payer/plan reimbursement strategy by tracking market share, copay, and reimbursement. Measure various financial metrics (such as WAC, copay, and insurance reimbursement) at a product level, including generics and specialty products. Compare your financial assistance programs against competing products to identify unique utilization patterns across geographies and sales territories.